We’ll start in sunny southern California where we find relentless heat without much room for relief in sight. Our top-spot-earning warmest city in the U.S. this past July not only had their warmest July on record, but also smashed the record for warmest month of any month in their history. That place would be the town of Chino, California. About 30 miles west from downtown Los Angeles, Chino is situated in the San Bernardino Valley – an area that is used to brutal summer heat. High temperatures in this area can routinely climb into the triple digits from March through October with peak heat occurring in July, August, and September. This July, all thirty-one days of the month featured above average temperatures. This included setting a new all-time warmest high temperature of 120 degrees. They would also set the record for their 4th all-time warmest high temperature at 114 degrees. Thirty days had temperatures at or above 90 degrees – that’s enough to be the 2nd most for July. Of those, eighteen days were at or above 100 degrees – that’s the most for any July on record. Another two days were at or above 110 degrees – that’s tied for first. Hot days rolled right into the night as 30 overnight lows fell at or above 60 degrees. 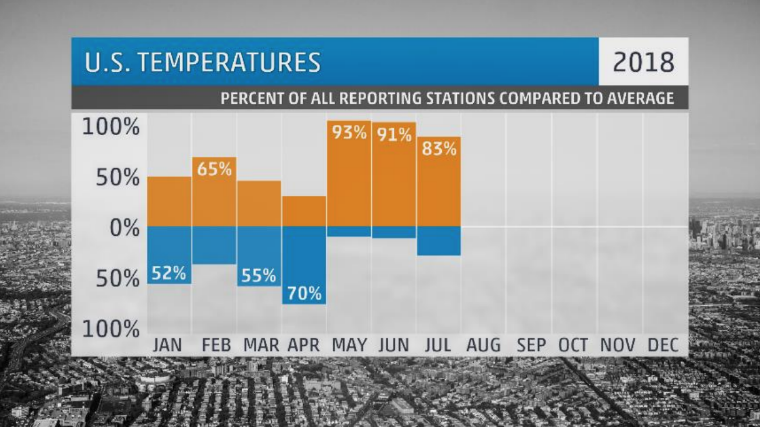 Of those, seven were at or above 70 degrees – that the 2d most on record for any July. One such overnight low failed to fall below 75 degrees and set the record for the warmest July low temperature. 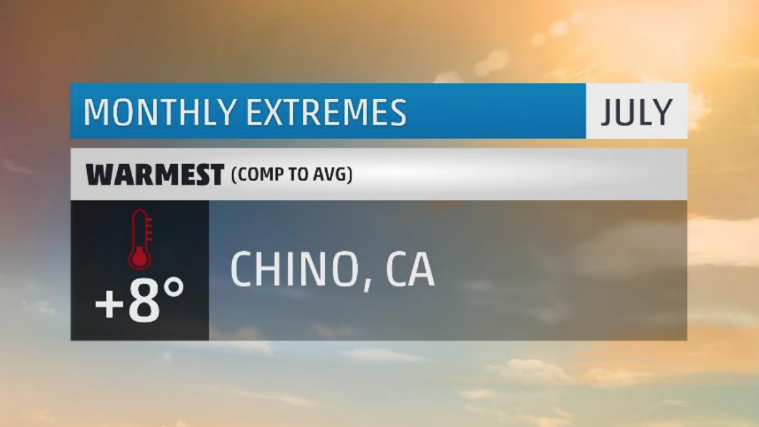 In all, Chino would set 9 new daily high temperature records and another 12 daily warm low temperature records. As usual, extreme heat was accompanied by extreme dryness. No rain fell during the month of July. Since January 1st, Chino has only seen about three inches of rain. July’s heat was widespread, reaching all four corners of the nation. One hundred and thirty cities would experience one of their top 10 warmest Julys on record with 19 having their warmest. 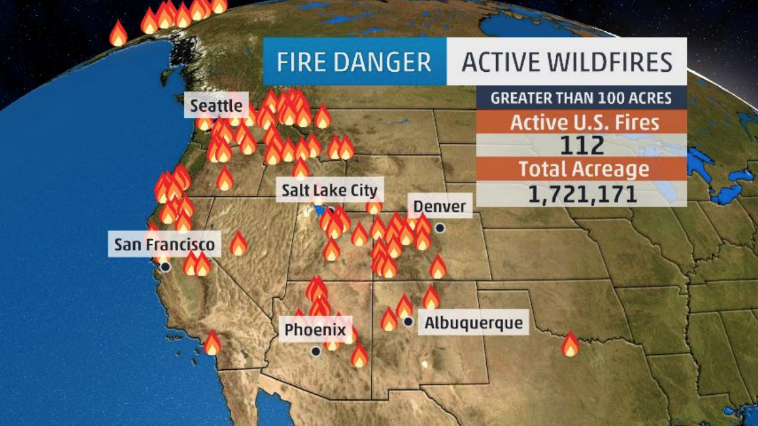 The majority of the record heat was situated over the West where persistent ridging has not only led to incredibly hot and dry conditions, but also provided the perfect environment for wildfires. 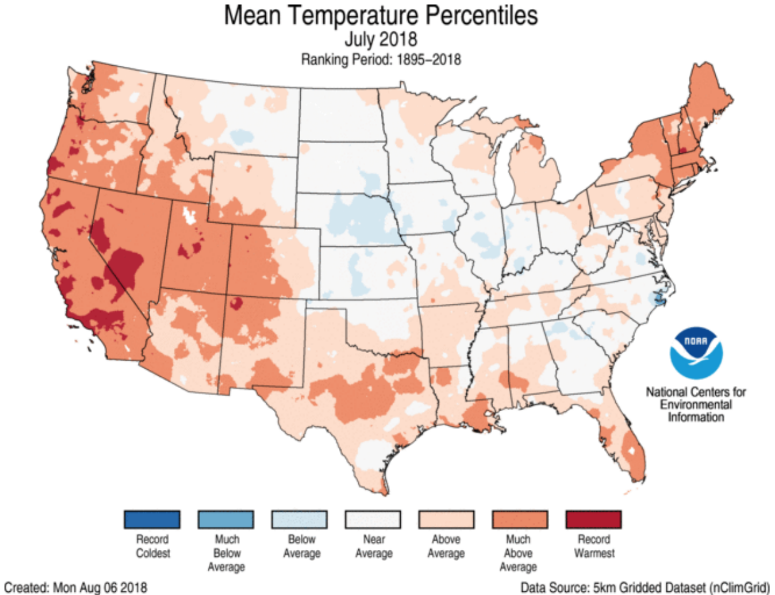 Our summer of heat rolls on as, yet again, more than two-thirds of the U.S. saw above average temperatures this month. We head to the nation’s heartland to find what little bit of coolness we could muster. Our place at the top of the cool list had their 3rd coldest July on record after just sweating through their 3rd warmest June. This thermometer flipping town is none other than Lincoln, Illinois. Located right smack dab in the middle of the state, Lincoln is familiar with both ends of the temperature spectrum in July. In previous years, the temperature has climbed high into the triple digits and has fallen deep into the 40s. This particular trip around the calendar proved to be on the chillier side of history. Twenty-one days saw below average temperatures including 12 days that failed to reach 80 degrees. One of those days stayed below 70! Not bad for the middle of the summer. That day was cold enough to set the record for 4th coldest July high temperature. Twelve mornings saw lows fall down into the 50s including a record setting low of just 50 degrees. Three daily cold high temperatures would be broken and another two record lows would fall before month’s end. The culprit for the cold was a stormy, dreary pattern that produced days of fog, mist, and almost daily rounds of showers and thunderstorms. The core of the coolest weather this July was centered over the midland stretching from the northern Plains through the northern Mississippi Valley. While they weren’t setting records for July cold, they did get a much needed reprieve from the heat that plagued the region since May. Moving now to the East coast where July was as wet and wild as can be. Our wettest city in the U.S. this month smashed their own record for wettest July, and came oh so close to setting their wettest month on record. This soggy city is the crown jewel of the Outer Banks – Hatteras, North Carolina. Wet records aside, July featured 17 days of rainfall where six would see more than an inch. 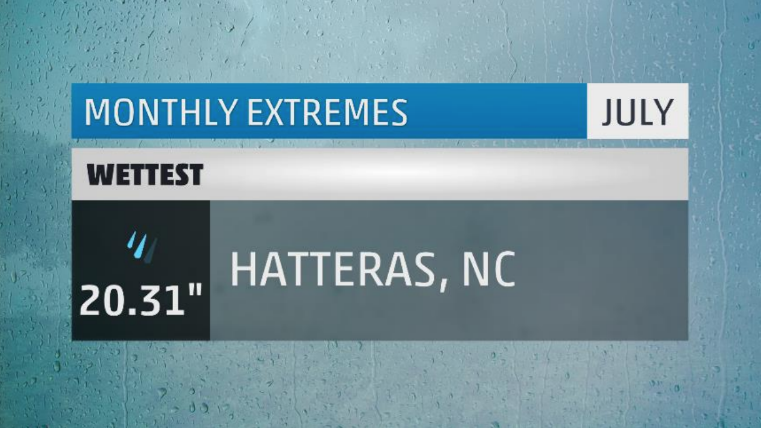 Over eighteen inches would fall in a ten day span making it the wettest such stretch on record in Hatteras. Among those ten days, three back to back days would see close to nine inches total. That too is a record for three-day rainfall. Believe it or not, Hatteras would only break one daily rainfall record throughout the month. Odds are, if your vacation brought you to the Outer Banks in July, it was more wet than wonderful. In what would be a tropical-fuel firehose of moisture, a streak of impressive rainfall stretching from the Carolinas through Central Pennsylvania would leave a path of flash flooding, mudslides, sink holes, and water rescues. Aided by moisture from Hurricane Chris, an upper air pattern developed a narrow corridor of flow from the southeast to the northwest over the region resulting in day after day of heavy rainfall. 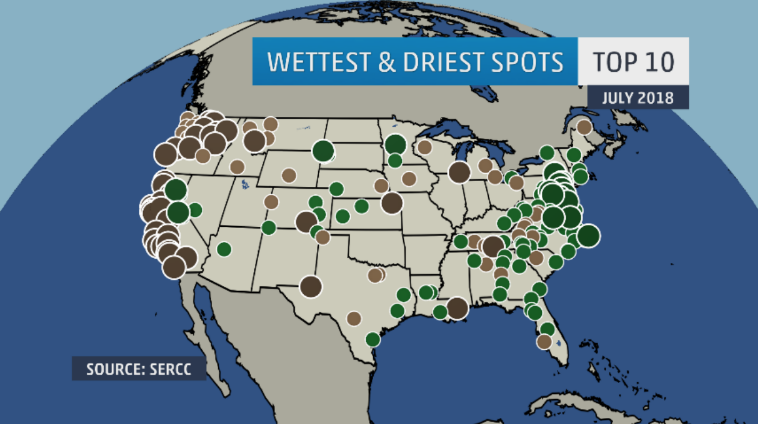 One hundred and five cities would have one of their top 10 wettest Julys on record. Of those, seventeen cities would have their wettest. The bulk of these fell in the mid-Atlantic where most areas saw day after day of tropically influence rainfall. Since we ended the month snowless coast-to-coast, I decided to share some stats on the month of severe weather across the nation. First let’s recap where we are in the year. So far in 2018 we’ve seen 713 tornadoes which is well below the year-to-date average of just over 1100. 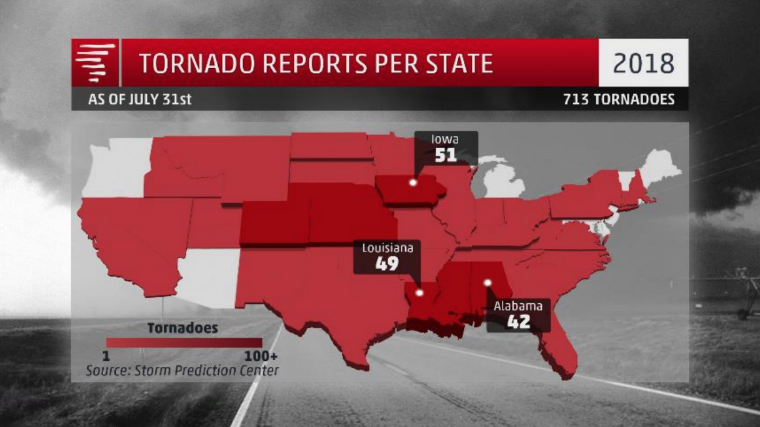 The majority of these tornadoes have occurred in the southeastern U.S. as well as in the high plains. Iowa leads the way with 51 tornadoes since January 1st. We were rather close to average during the month of July with 94 reported tornadoes. One particular hot bed for activity was the state of Iowa where we saw two of our strongest tornadoes on the year. 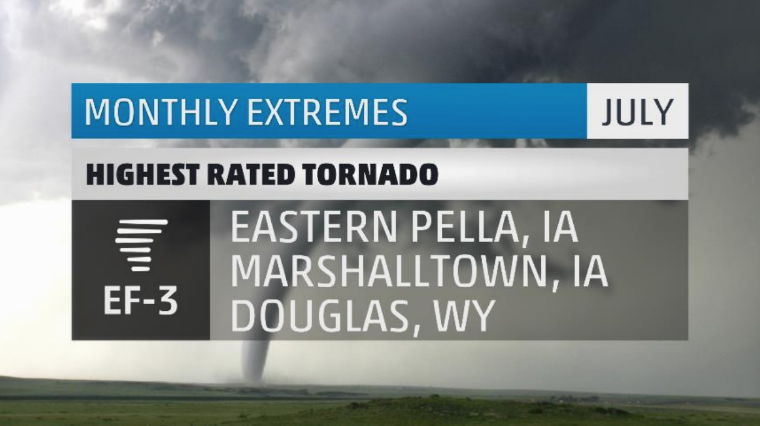 Both Eastern Pella and Marshalltown saw tornadoes on July 19th as part of a line of severe storms. 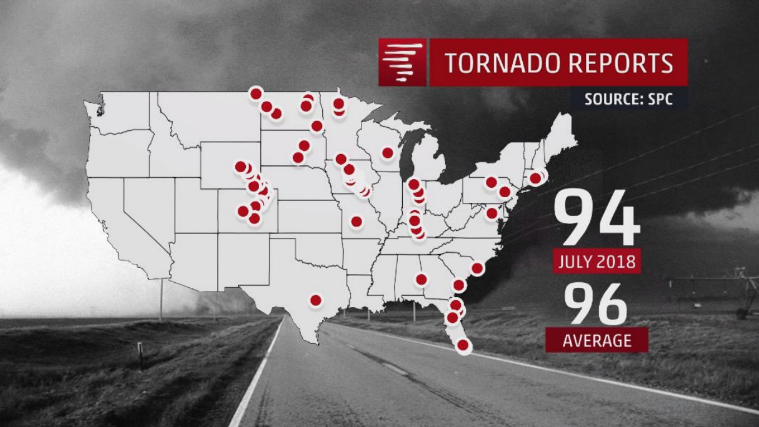 July 19th would eventually become the year’s 2nd biggest tornado outbreak day with 28 reported tornadoes. 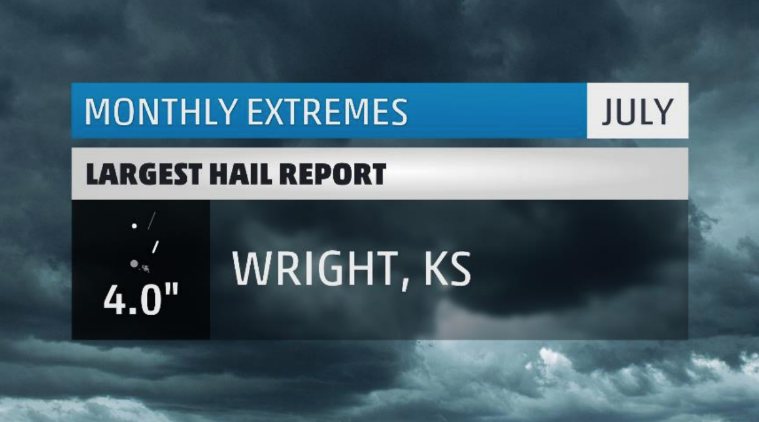 The largest hail fell in Wright, Kansas and was the size of grapefruits! 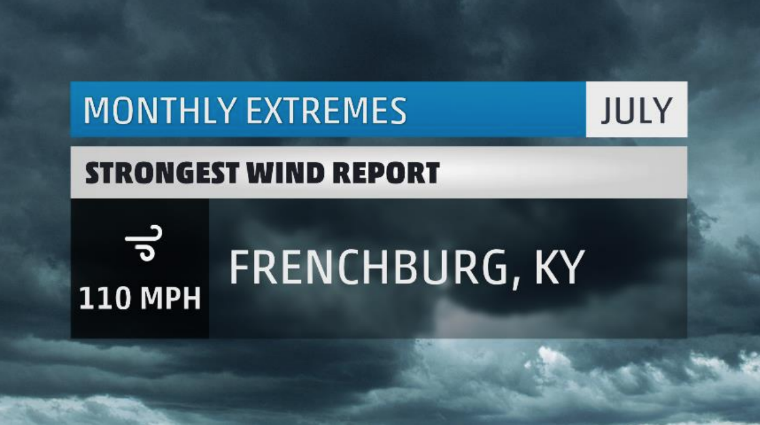 An incredible 110 mph gust was reported in Frenchburg, Kentucky. This was later ruled as a microburst which can create violent wind gusts as thunderstorms collapse. 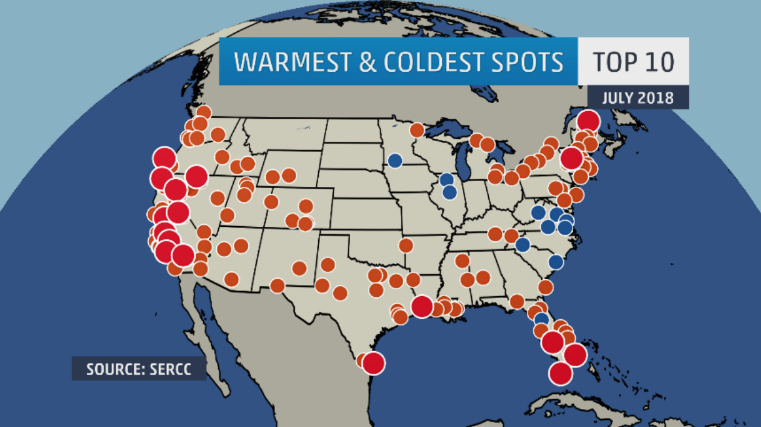 Our sunniest place should actually be four places. You see, four cities actually tied, to the decimal point, to be our sunniest city this month. So why did I choose one to be on top? Because I’m lazy and only want to write about one city, that’s why! Our pick for sunniest location has 30 cloud-free days. On that remaining day, a 20 minute thunderstorm produced just enough clouds to bump the single day average to 10%. When it wasn’t raining for 20 minutes, it was downright hot in Boise. They ended the month four degrees above average and had twenty-eight days with highs at or above 90 degrees. 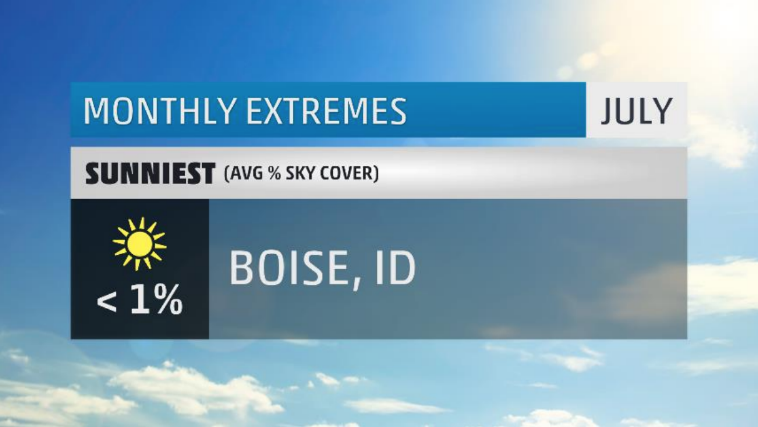 Statistically, Boise is the 47th sunniest city in the United States and they see their sunniest weather in July. Go figure. And finally, we’ll end our trip around country in not-so-sunny Florida. This time of the year is known to be rather volatile in the sunshine state. Any given day can produce brilliant sunshine or rounds of afternoon thunderstorms. Basically, take 50% of your days as good and the rest as not-so-good. In Tampa, they did a little worse than 50-50. Twenty-eight days saw mostly cloudy skies of which 21 produced rainfall. As expected, July in the cloudiest month of the year for Tampa. 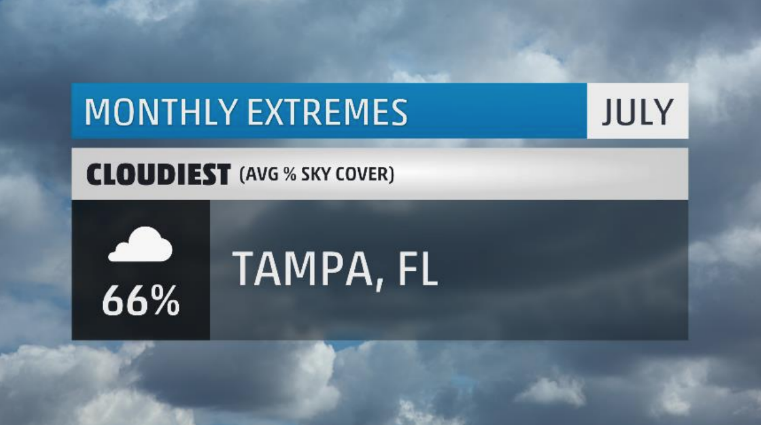 One crazy thing to think about is that Tampa’s 66% was the worst we had for cloud cover in the entire US. Even in places like the mid-Atlantic, where it seemed like it would never stop raining, ended the month sunnier on average than Tampa. There you have it, the extremes for the month that was July 2018. Make sure to check back next month to see what August has in store! 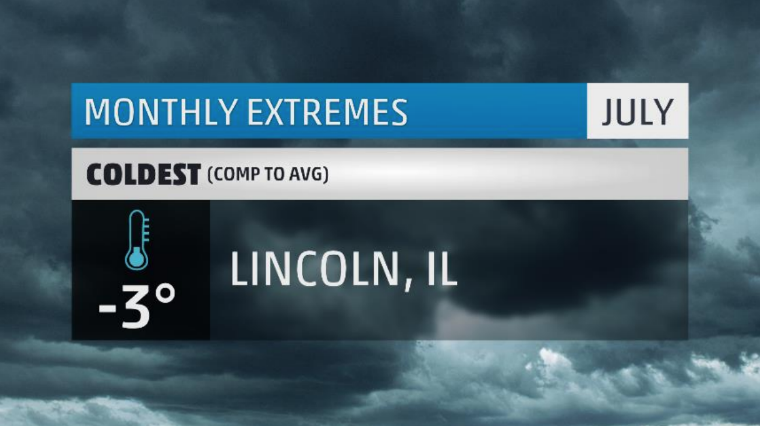 What weather extremes did you face in July where you live? Let me know in the comments below.